One of the top requests we’ve heard from enterprise customers is the ability for admins to manage Flows for their company. With this week’s release of the Microsoft Flow Admin Center, environment administrators can now manage all flows created in their environment. i.e. you can view all flows, delete or disable a flow, and view the connections used in the flow. To get started, head over to the Microsoft Flow Admin Center and log in with your corporate credentials. Note – You must have a Flow Plan 2 or PowerApps Plan 2 license to access the Admin Center. Select the Environments tab and choose an environment. Note – Only the environments of which you are an environment admin are listed. Here, you’ll see all the Flows created in your environment, across all users. You can delete any Flow or enable/disable it. You can also view details about the Flow such as when it was Last Modified, Created Date, and the Connections used in the Flow. We will continue to iterate on this experience and plan to provide the ability to filter Flows, view owners, and add yourself as a co-owner. Stay tuned! 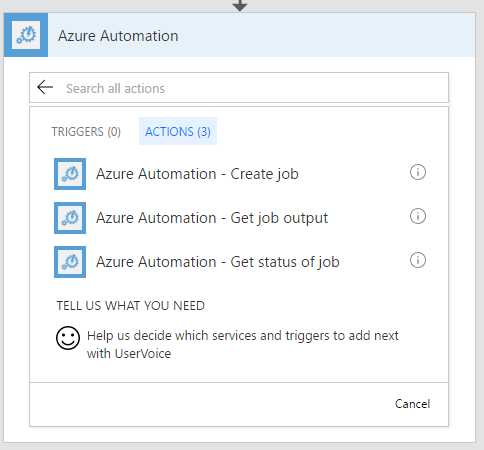 Azure Automation – Azure Automation provides tools to manage your cloud and on-premises infrastructure seamlessly. Basecamp 2 – Basecamp 2 keeps people on the same page. No matter what your role is, everyone works toward a common goal: finishing a project together. This brings our total to more than 100 different services you can connect to with Microsoft Flow, with more coming every single week!